Chris Paul didn’t go to Winston-Salem State University, but the Houston Rockets star dropped a generous gift to the HBCU. Chris Paul is one of the best passers in NBA history. Check the stats if you don’t believe its true. Paul just made a huge assist, one that he won’t get credit for in the NBA books, but one that will make a big difference to the HBCU in his hometown. The Winston-Salem native recently pledged to help Winston-Salem State University pay for student scholarships and uniforms. It was announced a few weeks back that he would do so via his family foundation, and now we know the amount. Paul gave $50k to WSSU, representing one-fifth of the $250k target goal. The former Wake Forest star’s gift didn’t just come out of thin air. His family has a deep connection to thet school, where both his parents attended. 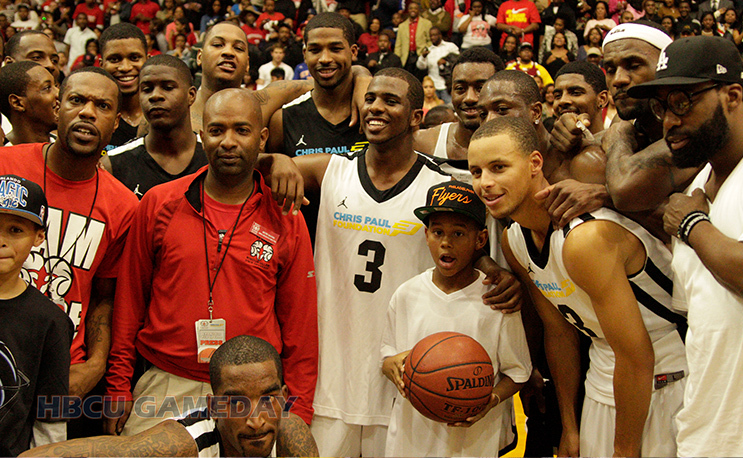 He brought basically the entire crew of NBA All-Stars to his hometown during the NBA lockout in 2011, playing the game at WSSU’s C.E. Gaines Center. This year, in particular, Paul has been a virtual walking billboard for HBCUs. He started the season opener by wearing a Texas Southern shirt to the Rockets arena and then rocked a WSSU one a few days later during homecoming. He’s kept that going throughout this basketball season, popping up with gear representing HBCUs all over. Other NBA stars have followed his lead this season by putting on HBCU gear when arriving to the arena or doing interviews. Perhaps they will follow his lead and in this way as well. The question “what if HBCUs got the best talent” usually comes up online pretty much every week. Perhaps we should focus more on getting players who are taking their talents to other schools to reinvest in HBCUs. Many players may have ended up at Power Five schools, but HBCUs have nurtured many of them. Dennis Smith grew up around Fayetteville State. John Wall was surrounded by Shaw and St. Aug and visited North Carolina Central during his recruitment. Steph Curry attended Johnson C. Smith’s basketball camp in Charlotte. That’s just a few players from one state. No doubt there are other connections. We’re not in the business of telling people HOW they should spend their money, and these relationships have to be cultivated on both ends. But a six or even five-figure gift at an HBCU is probably worth a lot more than a million dollar deal at the basketball factories they attended. Hopefully this becomes just as trendy.